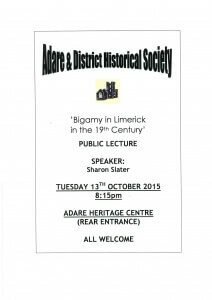 On the 13 October 2015 we were asked to give a talk on Bigamy in County Limerick in the 19th Century for the Adare Historical Society in the Adare Heritage Centre. There were over 250 cases of bigamy recorded in Limerick between 1800 and 1900. The talk included just a small sample of those recorded. There were many cases which were never reported or recorded. The following are the notes from the talk. 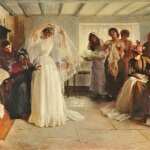 The Yelverton case was a famous 19th-century Irish law case, which eventually resulted in a change to the law on mixed religion marriages in Ireland. Under a Statute of King George II (19 Geo. 2. c. 13), any marriage between a Catholic (Popish) and a Protestant or a marriage between two Protestants celebrated by a Catholic priest was null and void. Daniel Robinson a Protestant married Anne Griffith a Catholic, they were living together before marriage and had children. Rev John Madden married the couple in May two years earlier to legitimize the children. Then he married fellow protestant Herminia Southerwood. It was decided in the court that “an Act of Geo. II declared the marriage null and void in law, whatever it might be in a religious point of view.” Daniel Robinson was acquitted. In 1857 a wealthy English Catholic Theresa Longworth married Protestant Major William Charles Yelverton in a Catholic ceremony. A year later Theresa suffered a miscarriage and Charles met and married fellow Protestant Emily Forbes. The case reached the Irish House of Lords where the ruling was in favour of the annulment of the first marriage. The case and its perceived unfair consequences, led to the enactment of the Marriage Causes and Marriage Law Amendment Act of 1870, under which a mixed marriage before a Catholic priest became valid and lawful, subject to the normal provisos of civil law. According to Judge Vandeleur in 1829 there were two exceptions to bigamy: 9 Geo N.
(B) If husband absent from wife for seven years she not knowing him to be alive. In 1852 Samuel Southell’s first wife arrived in Limerick. They had lived together in India, She was sent to Chester for improper conduct. They had been separated for over 7 years. As soon as he came to Ireland he married “a “Limerick Lass” who affords him the most striking proof of her affection, as it was stated that Southell was suffering from a pair of black eyes, which he got from his second cara sposa”. It was decided by the court that Southell should give his first wife 17s 6d a month and give her 30s to get back to Chester. July 1837 – Lancelot Ryan (37) transported 7 years. July 1842 – Patrick Dillane, late of Rathkeale, for bigamy, to be imprisoned for twelve months and to be kept at hard labour. March 1843 – Patrick Walsh married Catherine Minogue in May 1835 and during her lifetime married a Mary Cavanagh in Broadford, Co. Clare. Guilty. He was sentenced to 7 years transportation, the same day Cornelius McTigue was convicted of murder and also sentenced to 7 years transportation. March 1843 – Andrew Lyons (29) married Bridget Dunneen in 1840 in Bruff and Bridget Buckley in 23 November 1842 in Brockhill near Bruff. Guilty and sentenced to 7 years transportation. November 1900 – Patrick M‘Carthy alias James Sullivan (26), dealer, 6 months imprisonment. October 1909 – Anna Russell (33) Ballingarry, housekeeper, 3 months imprisonment. 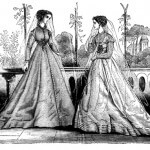 November 1849 – Dublin Police – Patrick O’Connor a native of county Limerick married Bridget Neville in Patrickswell and then Elizabeth McCabe in Frances Street Church, Dublin in September 1849. Patrick stated “he was drunk at the time of his first marriage and he did not think it binding”. January 1857 – William B Nesbie of the County Limerick Militia was accused of having a wife and nine children in Yarmouth and then marrying a young woman in Limerick she being a Catholic but the Rev Elmes of St John’s protestant Church marrying the pair. He was only found out when a letter from his first wife containing the names of his 9 children was found attached to the back of a picture which hung in his room. July 1840 – Patrick Horan, pensioner from the “94th regt. who came to Limerick on Thursday to receive this quarterly pension, was arrested by Sub-Constable Cornelius, for bigamy. Three of his reputed wives are here, and another was sent for to Cahirconlish”. 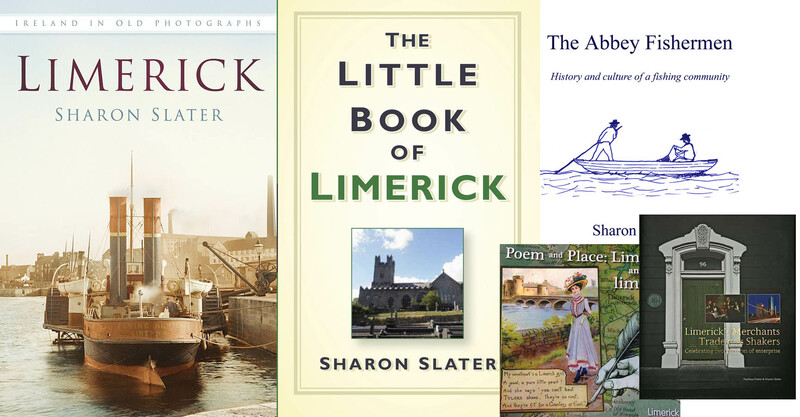 July 1842 – Patrick Ryan on 10 Jan 1835 married Honora Foley in Limerick in front of Dean O’Shaughnessy and on 7 April 1842 marrying Mary Morrison in Cratloe in front of Rev Mr Malone who gave the prisoner an excellent reference. The jury announced guilty without leaving the box. 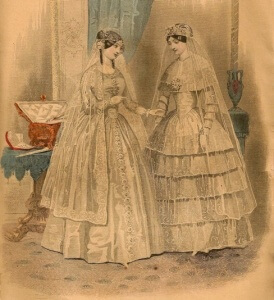 Wedding Costume – Godey’s Lady’s Book. Mar 1850. July 1844 – A case came to trial in front of Judge Kemmis of a pensioner Patrick Scanlan who about 12 months earlier married his second cousin by a suspended priest Patrick Byron and then married another woman by James Raleigh. A verdict of guilty was returned which shocked the local press as the first ceremony was not seen as being legal due to the marriage of cousins without dispensation. August 1844 – Thomas Tyrell an actor in the Victoria Theatre was brought to the Cork Police office under warrant from Sir Richard Franklin of Limerick City for marrying Mary Anne Barrett in 1837 his first Miss Ann Callaghan of Limerick wife still alive Sarah Clatyon, this marriage had been annulled. Tyrrell was married to 3 wives Sarah Clayton, Ann Callaghan and Mary Ann Barrett; Sarah Clayton and Ann Callaghan were both married to two husbands. February 1870 – Maurice Hartigan alias Kiely aged 25 born Fedamore, married two women in the same month one from Cahirconlish and the other in Croom. Convicted to six month imprisonment with hard labour. September 1849 – Fergus Kernan was arrested a woman named Mary Coyle stated that she was married to Fergus in Liverpool in 1847 and that he left about 7 months previously, she was told that he had been married to a woman named Bridget Flynn living in Kilrush and that he had spent the last 7 months with her. Fergus didn’t deny that he had been married before but said Bridget had died 5 years before and that he had children with her and it was them he came to Limerick to see them, he said he would have gone back to his wife in Liverpool but he didn’t have the money to. He had proven his first wife was dead. Fergus was discharged. 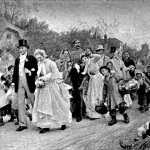 Civil registration of births, marriages and deaths was introduced in England and Wales only, but not in the rest of the then United Kingdom of Great Britain and Ireland, in 1837. Civil registration of non-Catholic marriages was introduced in Ireland on 1 April 1845. 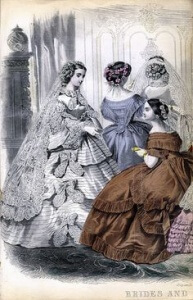 Civil registration of births, of all marriages, and of deaths was introduced in Ireland for events on or after 1 January 1864 under An Act for the Registration of Births and Deaths in Ireland. This made it easier to detect bigamous relationships. We have a previous post on one particular case of Bigamy involving David McGrath. Sources: Limerick Reporter, Limerick and Clare Examiner, Limerick Reporter and Tipperary Vindicator, Limerick, Dublin, Cork Prison Records, County Limerick Parish Records, Freeman’s Journal. NextThe Irish invented Halloween, fact or fiction?